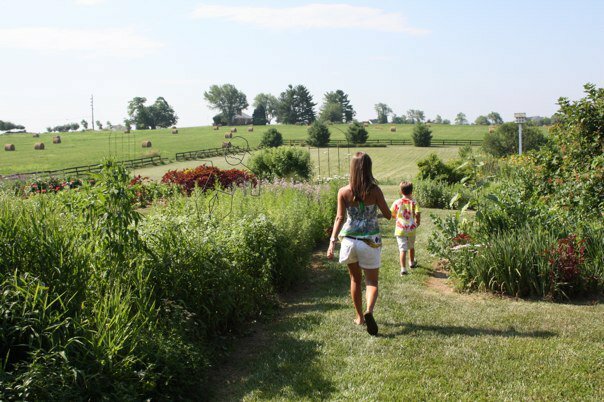 One hour west of the city, snuggled deep into Loudoun County’s rolling agricultural acres, lies a magical, mythical place beckoning to you. It’s true. 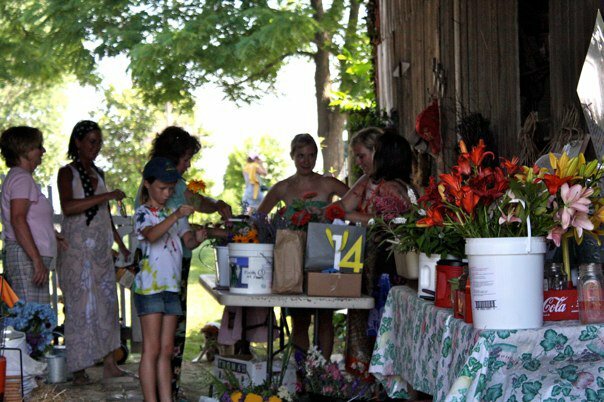 This mythical place is in fact a pick-your-own flower farm (tell me truly, have you ever heard of something so charming?). 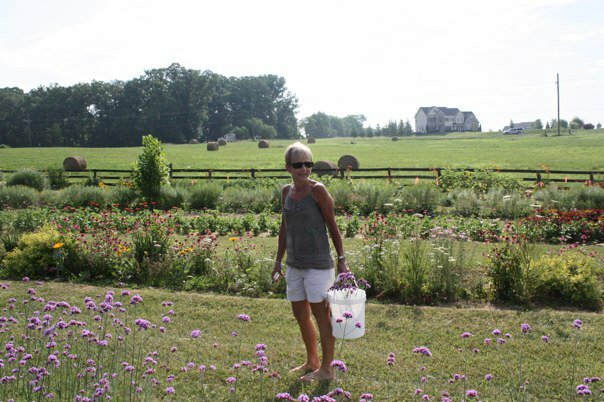 It goes by the name Fields of Flowers and it is run by Robbie, the sweetest, toughest flower farmer the land has yet seen. 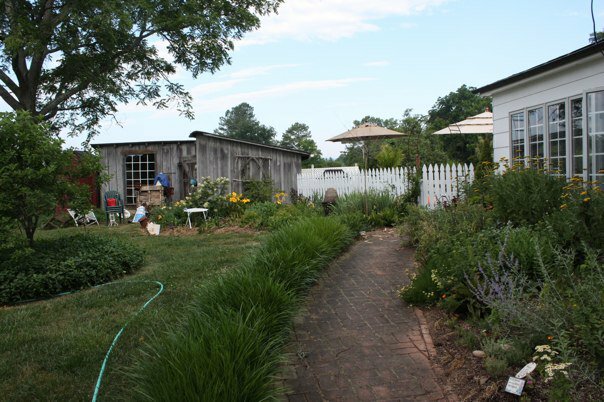 As you roll up to Fields of Flowers from VA-7, you’ll be swept off your feet by the sight of Robbie’s lovely house, nestled into the green grass, framed by hanging swings and lawn chairs, the house itself seeming to keep watch over her fields. 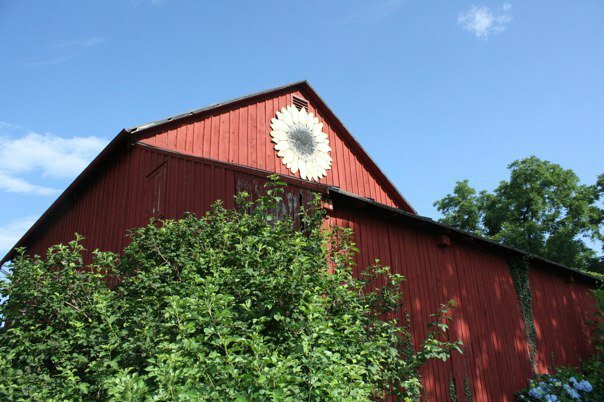 After you park, you walk a small path to a barn, where you are met with the sign, “Grab a bucket, read the directions, and have fun!” And there you have it–piles of buckets, piles of scissors, jars of water to keep fragile flowers hydrated–all of this stacked under a covered walkway leading out to…the fields. And there they stretch. 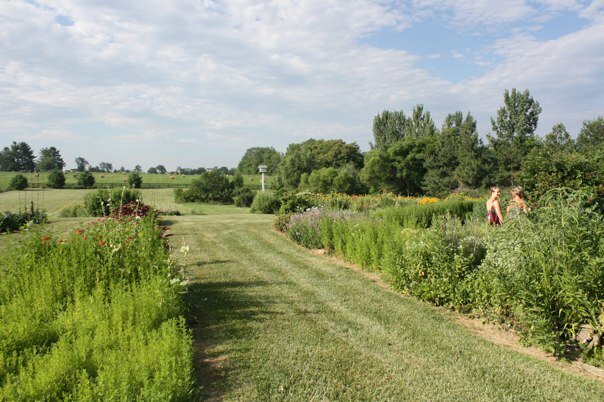 Acres upon acres of farmed flowers. You can’t imagine such a thing! 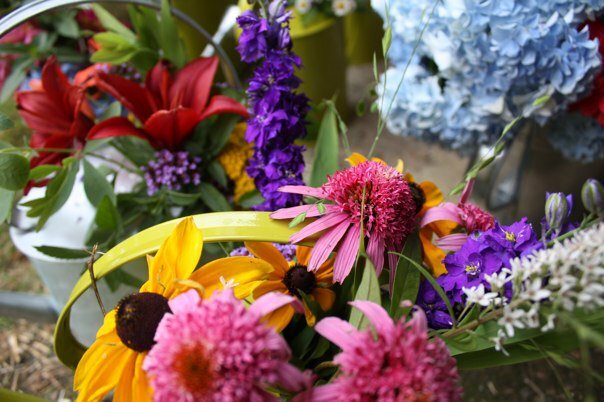 Plots of sunflowers rising to the sky, clumps of mint tickling your nose, bushes of yarrow–from colorado to common to paprika, lavender beds lining row after row, hydrangeas hanging off their stems like dangling Christmas ornaments…Lilies, snapdragons, butterfly bush, zinnia, daisies, phlox, larkspur…All grown by Robbie, and for $30 a bucket (a very roomy bucket, mind you! ), the fields are your’s for the picking. As I’m sure you’ve noticed, it is very hot this time of year, so the earlier you get your start, the better. 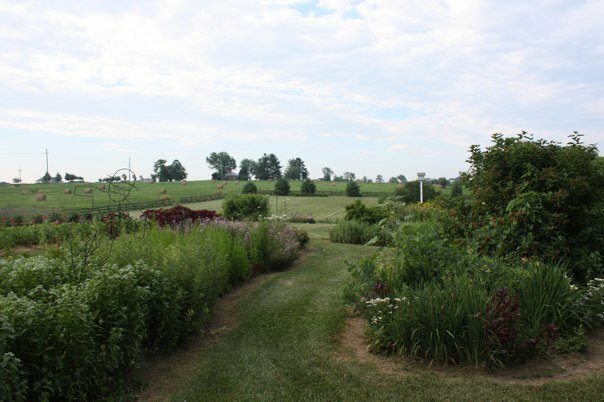 The farm is open Thursday through Saturday, from 8am until 6pm. If you want to wait until the weather cools off, Robbie lets you pick until the end of October, or until the first frost. 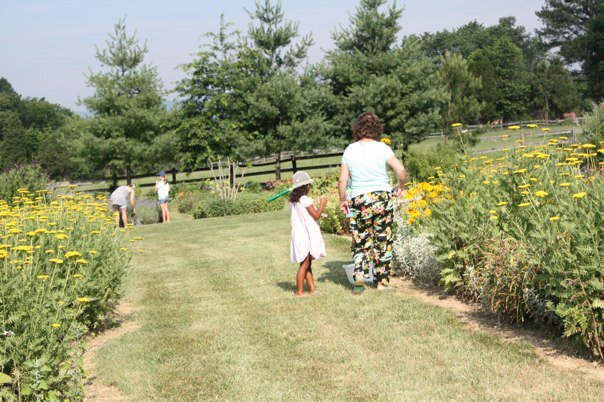 To see what’s blooming when, visit the Fields of Flowers website. 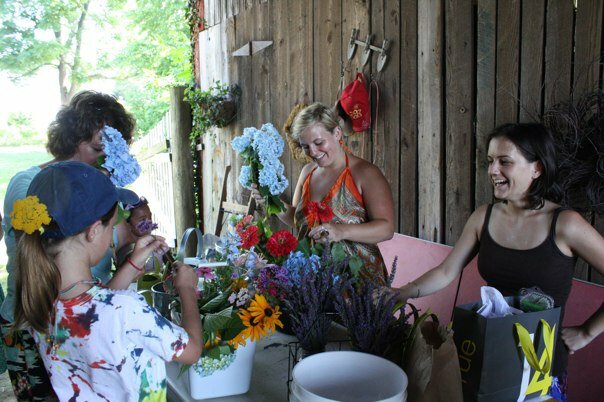 Okay, okay, I just have to say it, because I can’t keep it in: I picked flowers at Robbie’s flower farm for my wedding, and it was one of the best experiences! It involved everyone–my sisters and sister-in-law, mother and mother-in-law, best friend, flower girls, family friends, you name it! 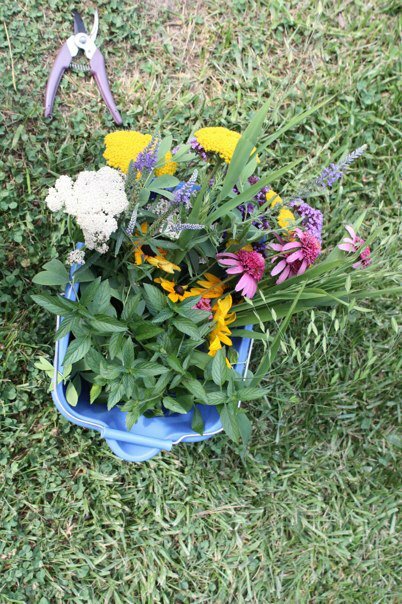 About 12 of us were armed with our buckets picking flowers like there was no tomorrow, and then arranging like the mad floral women we had become. And here’s the thing: you can’t go wrong. Everything is simply so beautiful, that you don’t need to stress about what goes where. As Robbie says, anything you do will turn out to be a “natural, garden look”. And that it did! 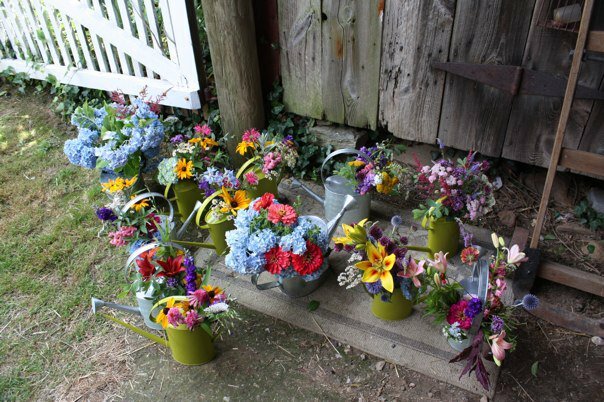 We had bought vintage watering cans as our centerpiece holders, and we just filled those babies with our hearts delight. And what a time we had! I REALLY recommend it for any bride-to-be, or simply any hostess!